Little Shop of Horrors – LIVE! The Kings Arms’ new Artistic Director, James Baker, is certainly looking to make an impression on Manchester’s busy Fringe scene. With his production company Assembled Junk, their last show, Spring Awakening, premiered to sell-out audiences and critical acclaim earlier this year. Now the team are back with a lavish adaptation of Menken and Ashman’s comedy rock musical Little Shop of Horrors. I’m sure you all know the story but if not: Seymour, a hapless shop worker, spends his days secretly in love with co-worker Audrey and raises a plant – Audrey II – in her honour, but as Seymour becomes an overnight celebrity nothing can prepare them for the devastation about to be wrought by the bloodthirsty Audrey II. Little Shop of Horrors has had a similar path to that of Audrey II as the show grows and grows in popularity – no doubt bolstered by the 1980’s Rick Moranis film based on the musical and Menken and Ashman’s later Disney credits. Assembled Junk’s production has high aims to give you West End quality for a Fringe ticket price. To this effect, the production oozes quality from the word go with impressive use of the limited space afforded by the Kings Arms’ intimate studio theatre. Assembled Junk have brought with them production values that many other Fringe shows would kill for. Duncan Burt plays the nerdy Seymour to great effect eliciting sympathy from the audience at his plight whilst Laura Harrison’s Audrey drips star quality thanks to her movie-star looks. Both her and Burt make a considerable impact in their duet, ‘Suddenly, Seymour’. Harrison strikes a chord between noble and fractured in a standout performance. David Zachary’s William Shatneresque portrayal of the bullying Orin is the cap on a memorably zany performance. Elsewhere, the hard working Greek chorus of Francesca Swarbrick, Christine Meehan and Paida Noel provide harmony and well choreographed movement as a trio of street urchins. The technically accomplished realisation of the Audrey II puppets are mightily impressive as they get bigger and bigger, and works to flex the muscles of puppeteer Jack Bradley. Zachary returns to make an audible impact as the mockingly booming voice of Audrey II, matching its bombastic and entertaining growth as a character. Baker’s direction uses every possible element of the space with characters appearing from every nook and cranny, but this does mean occasionally you’ll have to contort yourself to see the action. His use of a live band makes for a refreshing and tangible change – even if the band drowned out the actors at several points. Whilst Baker’s direction is innovative, it is symptomatic of a recurring issue with Little Shop of Horrors – it’s too big for the space at the Kings Arms. It feels like it desperately wants to straddle Fringe and a fully featured production and only just manages it. Kudos to all the team, but this isn’t Fringe – it just happens to be a full-blown production you’re seeing in a pub instead. Does that matter? Possibly not, so long as audiences enjoy this for what it is – and realise other productions are not able to be so luxurious. Little Shop of Horrors is a perfect anti-panto. It manages to be a witty production that maintains a feel-good atmosphere despite some of the macabre happenings. Adults and (older) kids alike are bound to enjoy this lavish and slick production that gives a highly recommended nights worth of entertainment. 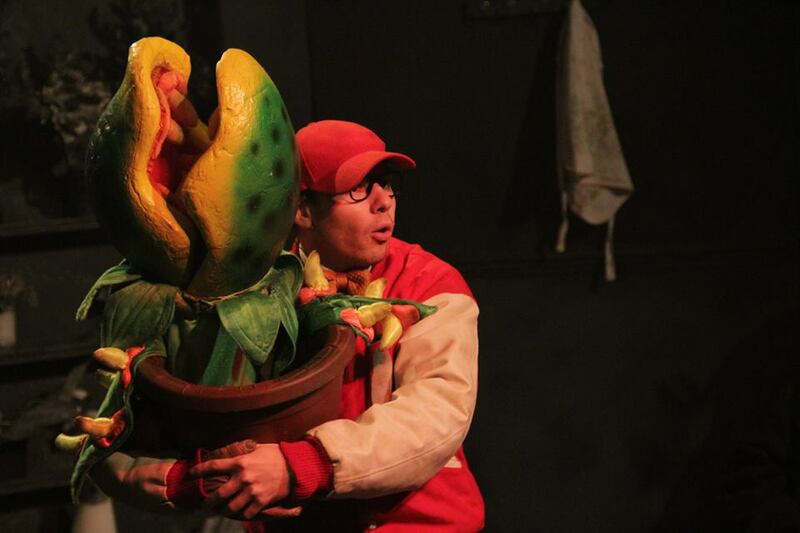 Little Shop of Horrors runs at Salford’s Kings Arms until 22 December. ← The Vicar of Dibley – LIVE!